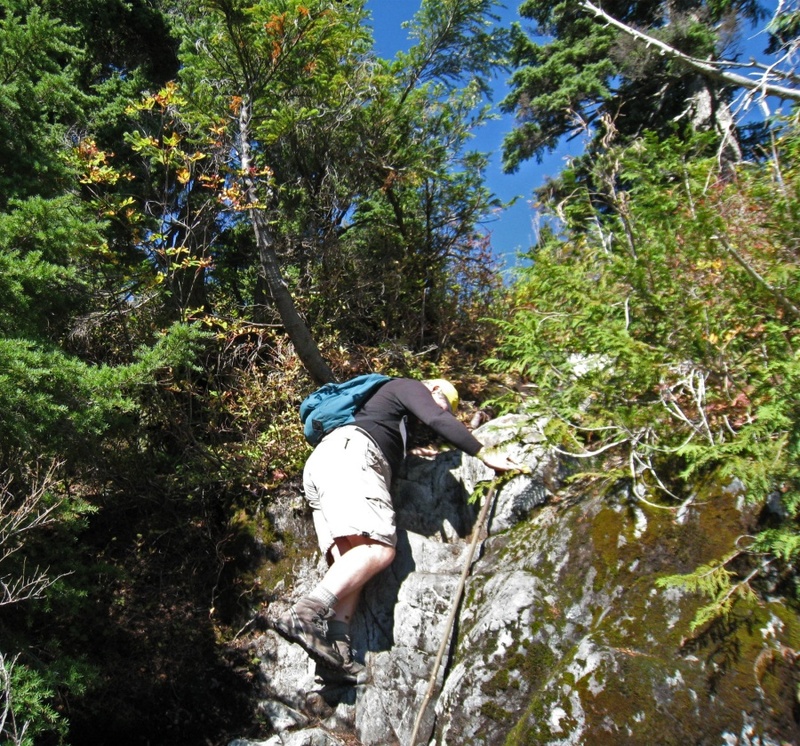 Yesterday two of us spent several hours bushwhacking in the upper part of the Mt. Gardner woods below the north summit and above Bluewater. It was a good test of my new trail runners as a replacement for hiking boots. In my last post, I described the new Saucony Xodus shoes and my reasoning for acquiring them. 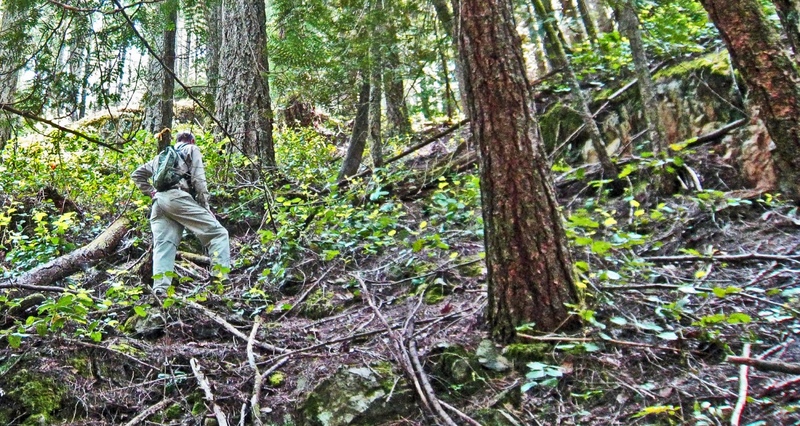 This area of second-growth forest is fairly open, sometimes steep, and there is lots of underbrush. I figured it would be a fairly good test of backcountry travel on the runners. 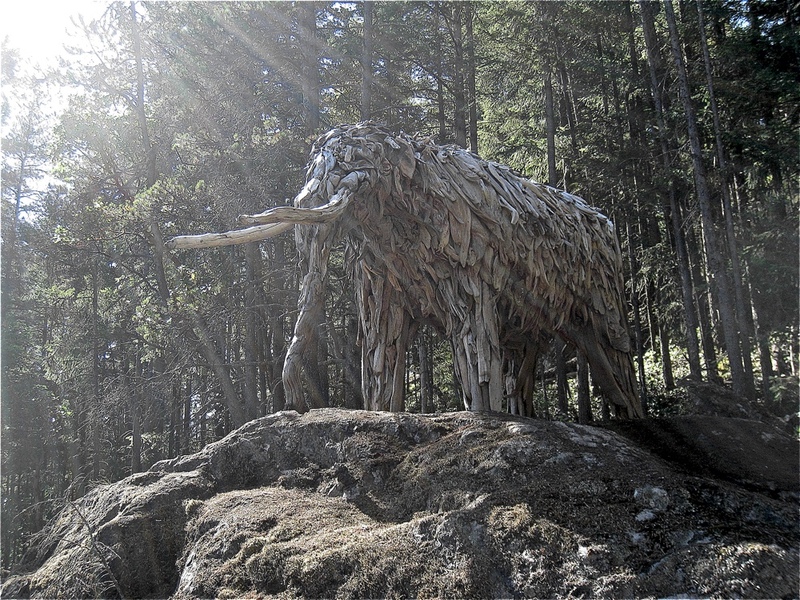 Since we were here, on Bowen Island, I was not committing to a trip far from home. My first comment is that using the runners instead of boots is somewhat different. On the trail, especially during the uphill grinds, the going is much easier with the runners. Oddly, on those sections of trail that are steep and rocky because rains have washed away most of the soil, I found the hiking much easier with the runners. The runners seem to require me to pay more attention to foot-placement. During this kind of bushwhack — fairly low level forest — I often cannot see my feet: they are down there obscured by the salal (gaultheria shallon). With boots I would confidently plant my feet on whatever support they could find, and then lift them up without too much worry about bumping into a rock or branch. My feet had lots of protection. With the thin mesh on the top of the runners, there is no protection. Even though the runners have a Vibram sole, it is more flexible than on boots. In steep downhill situations, with the stiff boots I might be able to dig the heel or side of the boot into the soil for some purchase, but I couldn’t do that with the runners. I had to keep the tread flat on the ground. So, in some circumstances, even with the Vibram sole, the footing was slithery. I was often reaching for vegetable belays. Also, during the downhill, I felt my toes were against the front of the shoes, and I was wondering if that would cause a problem. That was only a 6-hour hike, but afterward there was no discomfort. 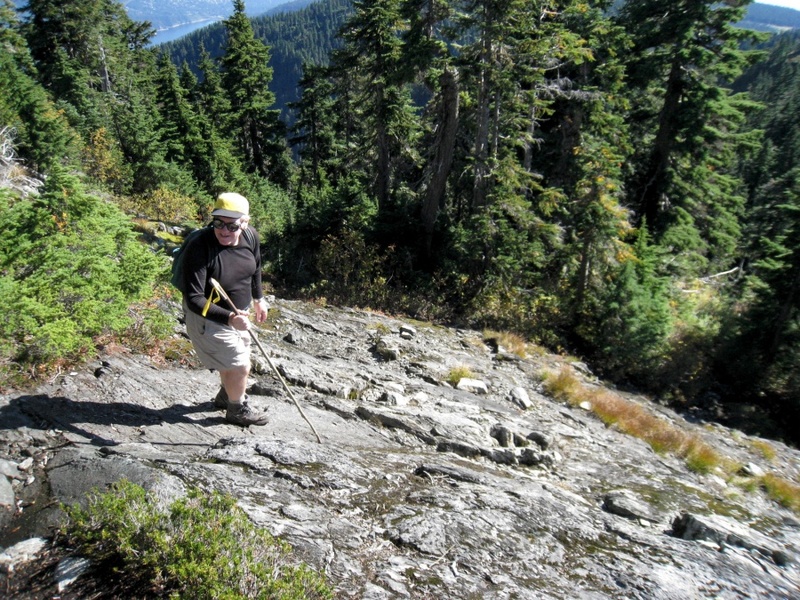 In the Section Hiker reviews of trail-runners-for-hiking, Philip has often said he does not use Gore-Tex because it retains sweat. For socks, all I was wearing was a pair of heavy liner socks. As soon as we returned to the car I wanted to take off the shoes to examine my feet. I was wearing the gaiters (described in the previous post), and I have to remove the shoes to take them off. After a day of strenuous hiking, my feet were only slightly damp… so the Gore-Tex was venting satisfactorily. In cold weather, I’m hoping the Gore-Tex will contribute to keeping my feet warm. The gaiters are waterproof, and I was surprised to find the inside of both were very wet with sweat. They are shorties, and there was no related discomfort. Their robustness was very useful protecting my ankles and feet as I slogged through the underbrush. The gaiters use a shoelace that goes under the runner. Two comments. First, the catelogue shows the gaiter lace tied on the outside of the foot, and the bungee for the part around the leg to be on the outside as well. I am simply not flexible enough to tie the laces on the outside of my feet. So, I put the gaiters on the wrong foot so the lace-ties and bungees are between my legs. Much easier! Yes, I expect the laces will wear out fast, but they should be cheap to replace. The real problem was that the laces untied themselves several times during the day. The gaiter seem to stay in place without them, so it was not really a serious situation. I would like a better solution. It was an enjoyable day rambling around the mossy bluffs and researching a better route from Bluewater to the North Summit. So far, I am satisfied that my day was much easier on runners than if I’d used my old hiking boots. I do have to pay more attention to how and where I am stepping, and I am probably learning how to do this efficiently. Crews on spill response boats work to contain bunker fuel leaking from the bulk carrier cargo ship Marathassa, second right, on Burrard Inlet in Vancouver on April 9. 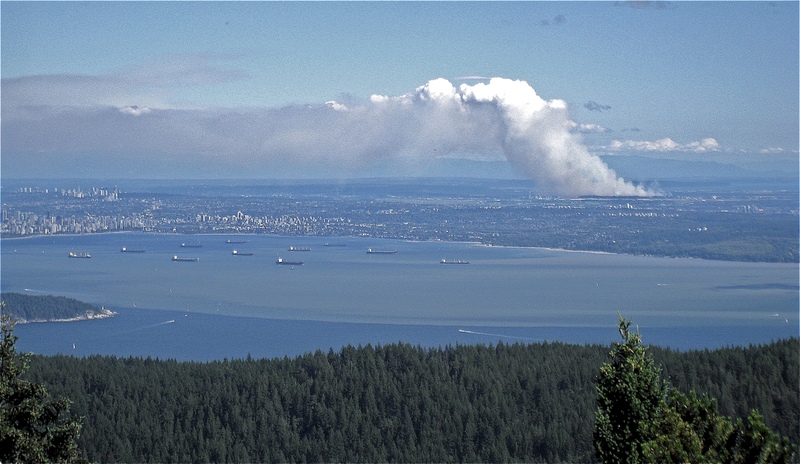 On April 8th the news media began reporting that there was an oil spill in English Bay, not far from my home: Bowen Island. Ten days later the Globe And Mail published an article that details the slow and ineffectual official response to this event, near Vancouver, and in the sensitive ecosystem of the Salish Sea. Looking at vesselfinder.com, I see that the ship that perpetrated the spill, the Marathassa, is still at anchor close to Vancouver’s beaches. Location of the Marathassa at the time this blog article is published. The temperature was just below zero when I walked down to the beach and took this panorama. The snow line on the hills is clear. My hope is that we will receive more snow below 800m in the coming month. 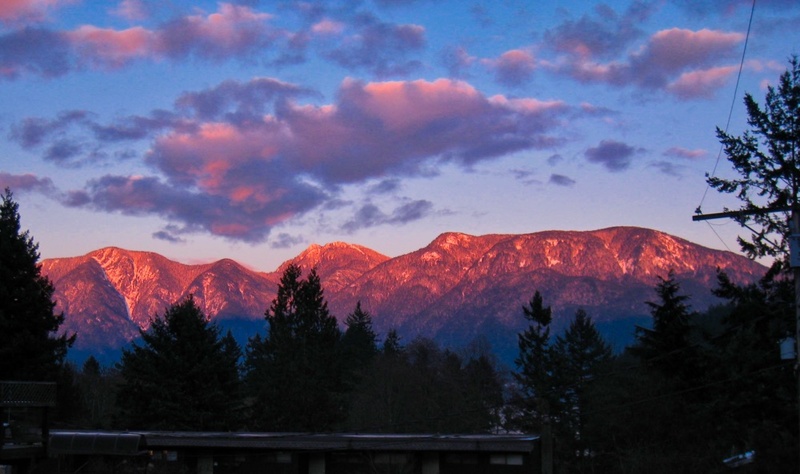 As the sun set less than an hour later, there was some alpenglow on that snow. Click the image to see it full-size. In the winter when I’m backcountry skiing, of course I use ski poles. While many people use poles for summer walking, I haven’t. 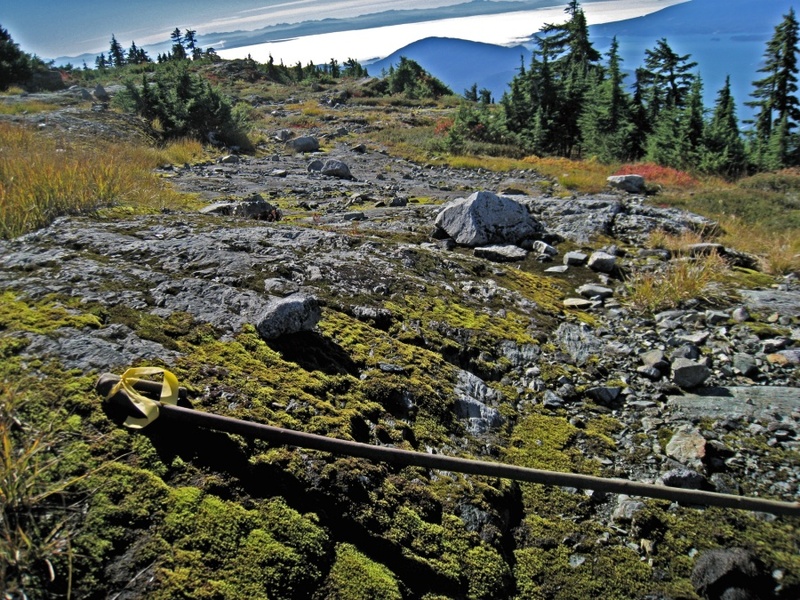 My curiosity was aroused last week when, last week, the Warden of the Bowen Island Ecological Reserve escorted a group of us into that untracked little wilderness. High in the hills is a small and magical fen. While it was a bit damp underfoot, and very springy, I was surprised that we could walk on the surface of the bog. 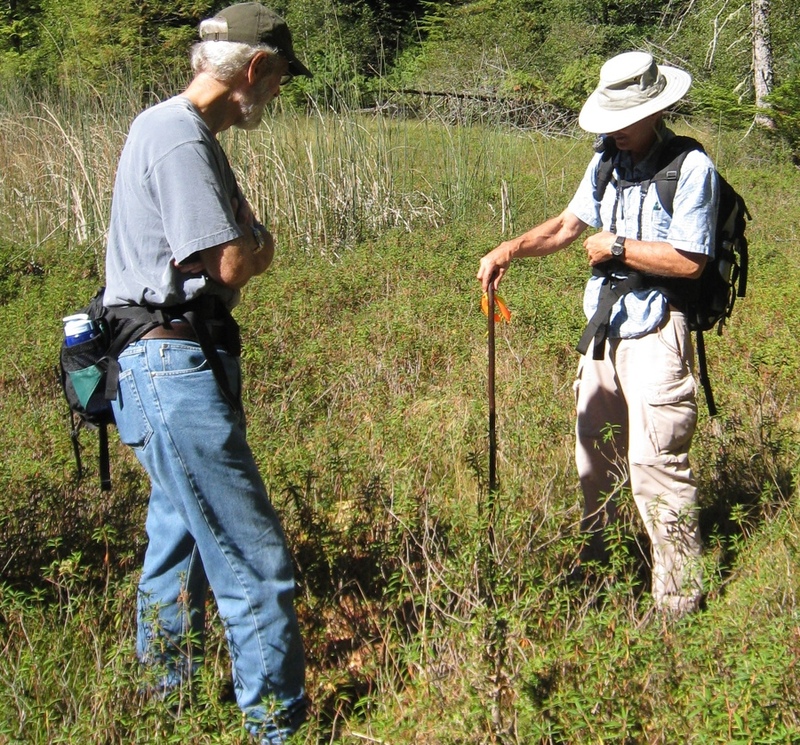 At one point while interpreting the bog, the Warden took his walking stick and plunged it straight down into the peat. It was all plant-matter, and offered a minimum of resistance. He never reached the bottom of the fen. I found myself asking about the sturdy walking stick that the Warden found useful all day. “Oh, it is made of Ocean Spray, and that is a common plant on Bowen Island.” Denis Lynn said that he was clearing out some by his house, and if he found a suitable piece, I could have it. Denis presented me with my new walking stick later in the week! 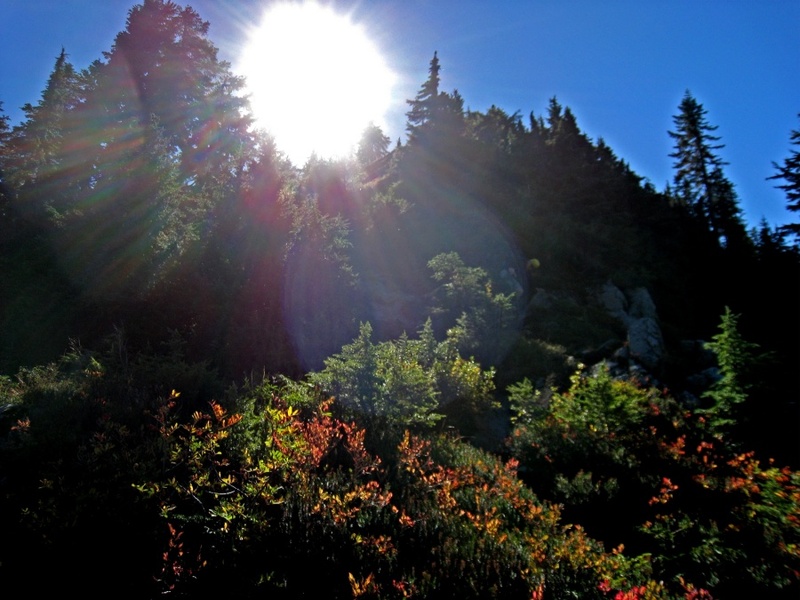 Yesterday, Sunday, was a stunning late-summer (ok, early fall) cool sunny day. 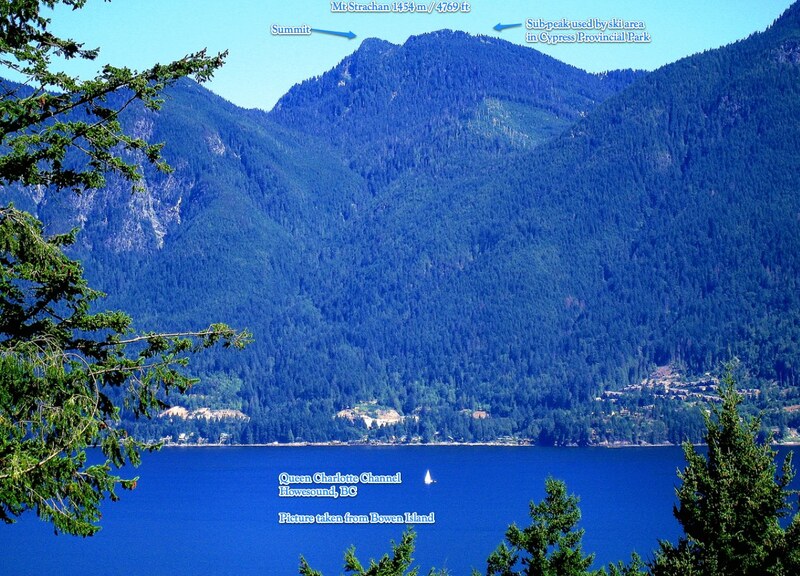 A couple of us wanted to walk in the hills, and the closest big mountain to Bowen Island is Mount Strachan. 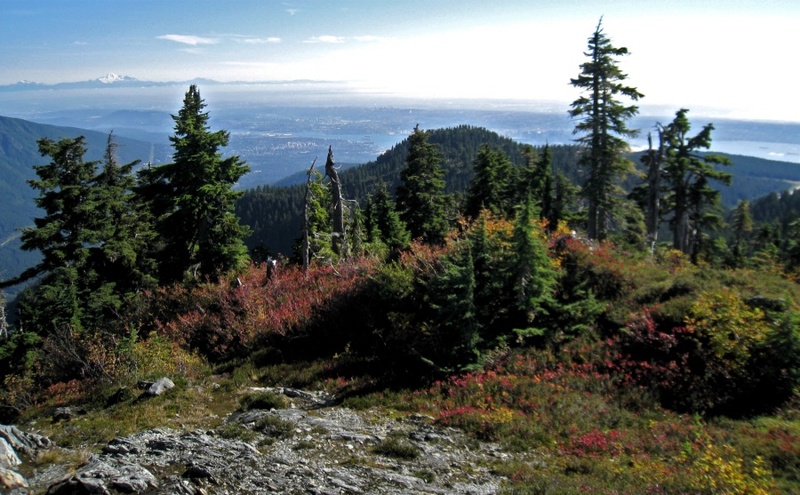 Access is an easy drive from West Vancouver up the paved highway to the ski resort. There is a trail, but since the resort is closed, we decided to enjoy the views and open sky by rambling up the ski slopes. 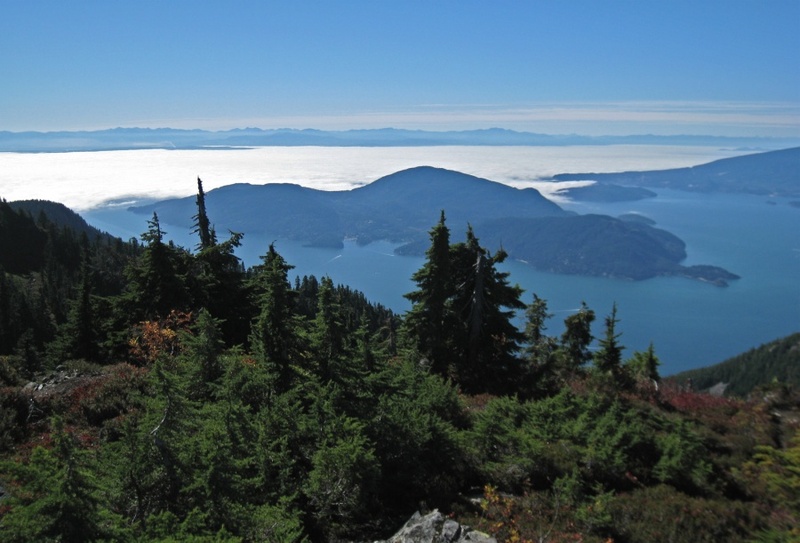 From the From the broad ridge of the sub-peak, there is a fine view of my Bowen Island. We were amazed to see that all of the vast Georgia Strait was cloaked in shining veil of fog. 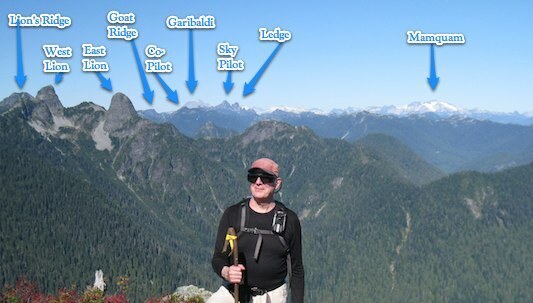 Somehow, Bowen Island and Howe Sound were clear. Not everyone who heads up this hill bothers to scramble over to the real peak. It is worth the extra time because the views are outstanding. In the winter, the ski resort considers it to be out of bounds, and that might explain people’s reluctance. Also, it is not easy walking. The descent from the sub-peak to the col is steep and slippery. The climb up to the summit is a little bit easier. The summit is a secure dome with outstanding views in every direction. 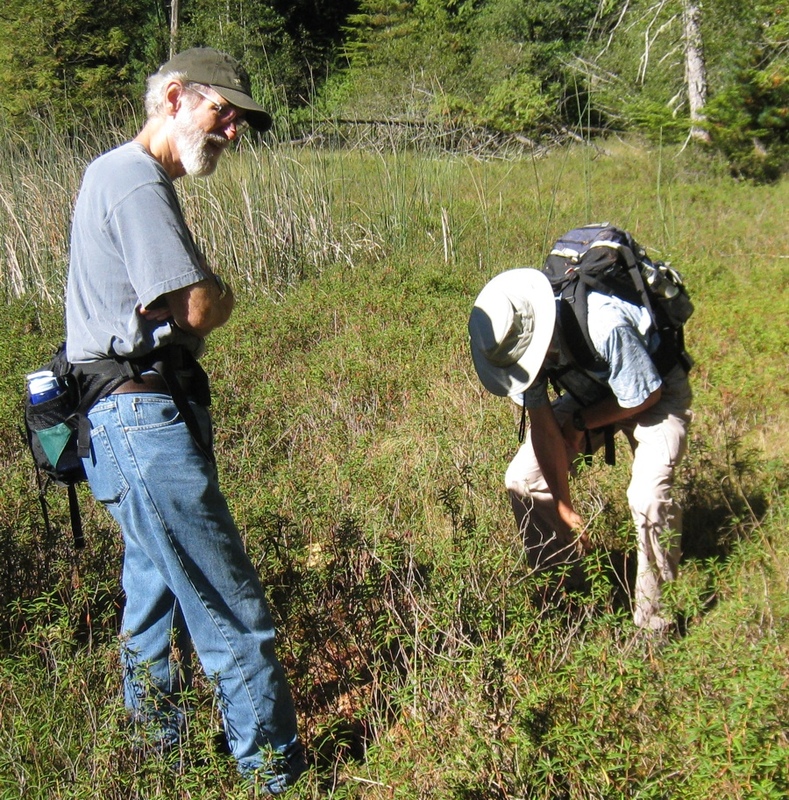 For the record: That walking stick is made of Holodiscus discolor, also called, ocean spray, creambush, and ironwood.